The most important news right now is our new website going online and a new catalogue. Our many loyal customers have been asking about this for a long time and all of us at Arelle are grateful for their patience! We are sure that the wait has been worth it. We have responded to customer requests by adding larger sizes in most of the product ranges. There is now a much greater range of Stretch Briefs which are essential for holding pads in place and helping them to work better. The soft cotton briefs look and feel like standard underwear. Pull-up briefs are becoming very popular. This is due to their improved performance and ease of use. They do cost a bit more than shaped pads but our main supplier, Abena, and ourselves are trying keep the price as low as possible. We have increased the range of pull-ups available and added a few Tena pull-ups for light incontinence because of their different design. Skincare is an aspect of dealing with incontinence that is often overlooked. There is a huge range of lotions, ointments and soaps available so we have used our experience to select a small number of quality products that should meet all your requirements. Arelle continues to offer products made in the UK where possible. All disposable products, no matter who supplies them, are made overseas but due to Arelle’s success we have been able to resist price rises on many products. And of course, you can make big savings by buying larger quantities. 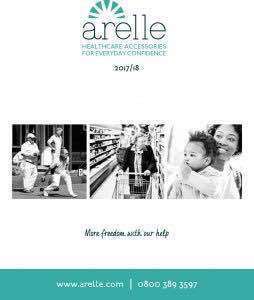 At Arelle we try to make selecting incontinence products less bewildering. We aim to ensure that every customer uses the most appropriate products. Arelle welcomes your comments on our products, our service and on our new website. Please let us know what you think.